The Mara Wall Sconce by Tech Lighting features two frosted glass orbs adding charm as the LEDs illuminate through diffusers to create a soft glow. 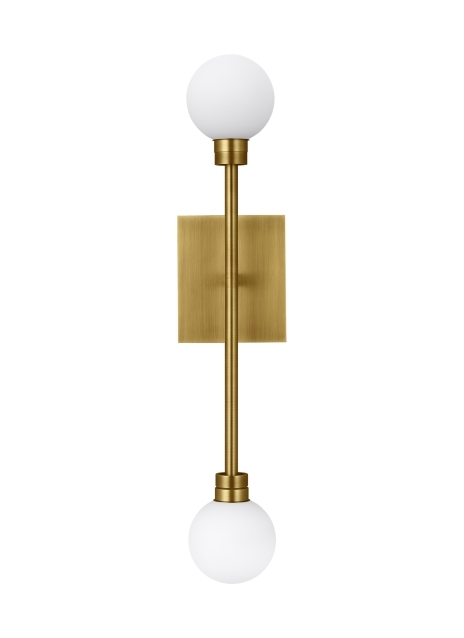 Offered in three distinct finishes, the Mara Wall Sconce rounds out the entire Mara family of chandeliers, pendant and ceiling mount. Mounting options include vertical or horizontal, great for any bathroom or vanity lighting. Lamping options are compatible with most dimmers. Refer to Dimming Chart for more information. Includes (2) 120 volt 8.7 watt (14.4 total watts, 610 delivered lumens) 2700K LED module. Dimmable with most LED compatible ELV and TRIAC dimmers. 277V compatible with 0-10V dimmers. Mounts up or down.